If you use the new Internet Explorer 9 beta (IE9) on Windows 7 and have a blog on WordPress.com, you should definitely check out some cool new features. First, not only do the charts on your stats page load faster — thanks to new canvas element support in IE9 — but each WordPress.com site also includes a high-res icon for your browser, taskbar, or shortcuts. Once you start using IE9, you’ll find this icon comes in handy when you want to “pin” a blog. Wait, just what is pinning, you may be asking? It’s actually quite simple and a lot like bookmarking but on your computer instead of in the browser. Once pinned, you can launch your blog right from your Windows taskbar. A handy context menu lets you access some of your most common tasks such as adding a new post or moderating comments, with a single click. You also can pin a friend’s blog to stay up-to-date on their latest posts. When you sign in to your blog, you can pin your own site and get extra tasks that make blogging easier and faster. A logged-in user can quickly access links to their dashboard to write a new post, moderate comments, upload a new file, or view blog statistics. (Each task only appears if the user has that task’s capability, such as site administrator’s.) A custom list also displays up to 5 latest posts for the current blog context. You can pin someone else’s blog, too. When you do, an icon appears that lets you subscribe to the blog feed, signup for a free blog, read Freshly Pressed, and access WordPress.com Support and forums. This is simple: Just visit a blog in a IE9 tab, grab the tab, and drop it onto the taskbar at the bottom of your desktop. When you pin a site it will either show up as a large WordPress logo or as your own Blavatar if you’ve uploaded one. P.S. : You can learn more about IE9 on Microsoft’s Internet Explorer blog (hosted on WordPress.com!). It’s 2am, Where Are Your Posts? That is an excellent resource for IE users. Unfortunately I don’t think I know any IE users. Most people I know use Firefox. That’s kind of cool. Almost makes me want to download IE9. FF is kind of bloated bc of all of the add-ons and extensions. Don’t use Chrome. I haven’t taken the leap into IE9 yet, and didn’t really care before, but that pinning thing sounds interesting. Ok. Great post. But I’m not in big love with IE9 nor do I like the way WordPress.com is *indirectly* promoting IE9 by firstly putting it on the front page tagging as Sponsored Post and now promoting it from its official blog. wow!!! thanks for letting us know! I’ve already done this with Facebook and I just made it with my wordpress.com blog. This may come in handy. Thank you. Oh my! That is so cool! Thanks for the info. I’ll update my PC and get back to your post! Thanks again! Haha. I don’t think I’ll ever go back to IE. But this is great for the majority of user who do! A very useful tool 🙂 Thanks..
And I did notice that the stats charts were loading quite quickly too! Does this work on other windows computers like Windows XP? Microsoft system requirements state that IE9 requires Windows 7 or Windows Vista SP2 (with Platform Update). Windows XP is not supported. This is good. It may even make me want to use IE again! Hope it’s fast too! Even so I still will not use IE9. That’s amazingly cool future centric feature for the WP users. Thanks to both IE9 and WP producers! I have some bugs using IE9 and WordPress. I can’t write new posts. I can’t place the cursor in the box to type. But I love the jumplists. They are really cool. Doesn’t work for me just pins a shortcut to my blog on the taskbar that when clicked on opens IE9 and loads up my blog. This’ll be a useful feature to be sure. Thanks! Ugh! I still can’t let go of Fire Fox. I am good with Win XP and FF. Nice “pinning” feature. Too bad I have to switch back to Windows XP (IE9 is not supported on XP). Try Firefox– you’ll love “not having a crappy browser”. It’s a nice feature but I keep finding IE9 starts fast and looks impressive, then slows down and becomes unresponsive and unreliable after about an hour or so of use. Unfortunately, though, since the launch of IE9 I’ve found that WordPress has become unreliable in my browser of choice, Google Chrome, where before it worked perfectly fine…! nice idea right there hope to see more tricks…..good luck! 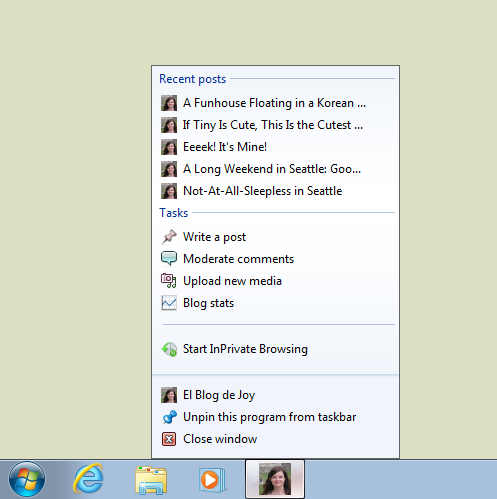 yea this a cool feature of pinning pages to your windows 7 taskbar. Not good. Supporting IE9 only features which are unlikely to be accepted by other browsers is not a good development. IE is VASTLY inferior to ANY other web browser. Try the acid 3 test (http://acid3.acidtests.org/) on FireFox or Google Chrome and you’ll see that it’ll pass the test whereas all versions of IE fail. That will save some time! Cool feature. Will definitely use it. Well I certainly will not be using this feature, as I have a MacBook, though I must say this is a pretty neat feature. Internet Explorer 9 is great. Those of you dismissing it without even trying should get out of their sheltered world. This feature is a must-have! Very coool. Now if only I had Windows 7! Cool feature but not cool enough to make me want to install IE9. I have Windows 7, so I tried it. It pinned my site OK, but IE9 kept crashing on me, and I was unable to work on my blog.. I deleted it, and am back to IE8. It’s a battle for market share for sure. According to W3Schools, the vast majority of MS users still use XP. Right now, I’m sticking to Windows7 and Chrome on my netbook (and thanks for the tip about the pinning function, works great) and XP and IE8 on my desktop. Nifty app. Perhaps consider making this feature for Google Chrome? Site Pinning is a feature that’s unique to IE9 right now. add a cup of peanut butter and I might eat this. That looks awesome. Hoping you can show the love to Chrome and Firefox users too. win 7 + ie9 = future. Sounds great. Every little bit helps! Some great features – personally will be sticking to Google Chrome though as it seems to be about the fastest and also has some fantastic features. I would recommend trying it out. Opera’s also very good. I think it’s a shame that a lot of people don’t even realise there are other browsers out there and a few that are as good if not better than IE in my opinion. Great article though – thanks for sharing.
! Hey, think this is a great tool for IE9 users. Been playing with the pinning with IE9 Beta and Win7, however I’ve noticed that although the dashboard for WordPress loads faster, the actual main post window has an issue with accepting and saving text. Had to turn on compatability mode to workaround this. i didn’t know it works with WordPress. That’s so cool. I’ll try it when I get home. Thanks for the tip! What about us non Windows 7 users? Anything new coming for the rest of us? This is ‘nifty’, but I wouldn’t say it was ‘awesome’. You can do something similar using Google Chrome – simply navigate to your blog, then from the options menu select tools then create application shortcuts… and you’ll be given an option to pin your blog to the Win 7 taskbar. It’ll even sit in its own standalone window, rather than just opening in the browser as it does in IE9. I use this for my GMail account, which gives me a ‘standalone’ e-mail application without having to run Outlook or similar. I’ll grant, this doesn’t give you some of the menu options such as accessing browser stats etc., but you’re only one click away from them anyway. Great post and tip. I actually posted about this just the other day regarding IE9 – which has some very cool other features – http://teabrooke.com/2010/09/16/top-5-favorite-features-of-ie9-beta/. And you can actually do the same type of “pinning” in Chrome, which I blogged about here: http://teabrooke.com/2010/09/19/how-to-pin-websites-in-google-chrome/. Allows for such quick and easy access to the sites you use frequently throughout the day – like our blogs! You know what would be aweeeesome? The possibility of creating short posts right from the jumplist. Not sure if win7’s taskbar capabilities go that far tho. Still good thing you’re working with IE9, looks like a fine browser. Please don’t encourage people to use Internet Explorer. That thing is a morass of ugly security problems. cannot use bold, italic, etc. So, I use ie9 to check stats and firefox for posting.—not very helpful! Oh 😦 IE only? What about Linux bloggers? @monica – it’s not quite the same, but you can ‘pin’ your WordPress blog using Chrome. Click the ‘spanner’ while you’ve got your blog open, go to Tools and then click Create Application Shortcuts. This does look really cool! I like the fold down menu…awesome! I’ve run into a few minor issues with IE9, but we must remember, it is only in Beta testing at the moment. Cool….but I can do this in Firefox and the Mac OS already.